Michael Curry (left) plays Booth and Dorian Lockett plays Lincoln. Why does a play win a Pulitzer Prize? In the case of 2002 winner Topdog/Underdog, it’s likely the lyrical or comedic language of playwright Suzan-Lori Parks. Layer her well-chosen words on top of the gritty, face-to-face reality of limitations and lost opportunities for two African American brothers, and the drama boxes its way into the prize ring. Lincoln is the eldest, named for his job as an Abraham Lincoln impersonator. Three-card Monte novice and shark-in-training Booth, his younger sibling, allows Lincoln to move in with him and is dependent on the shared income. 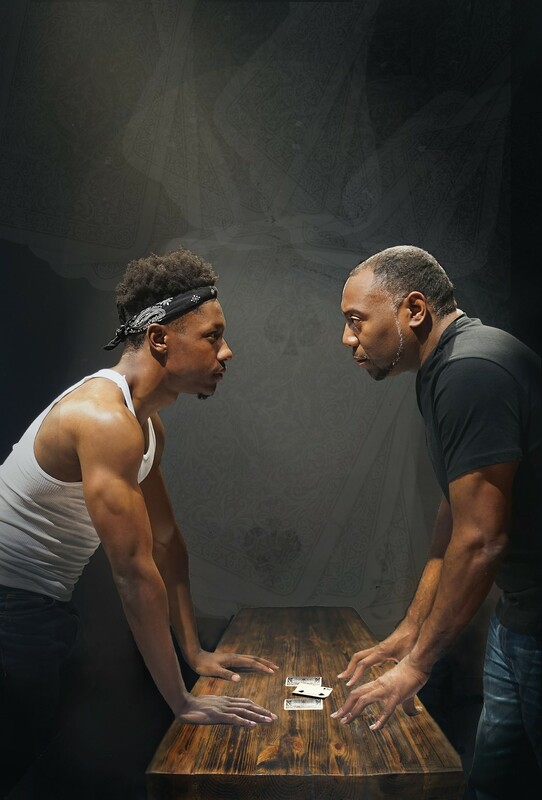 Locked in the competitive closeness special to families, the two-act, two-character play taps on timeless themes of masculinity, fate, life’s surprising humor, gun violence, and familial love and hate. Ubuntu, known for its site-specific presentations, drops this production into its new, intimate, black box theater in Berkeley. It’s a fine setting for this taut, ambitious drama.